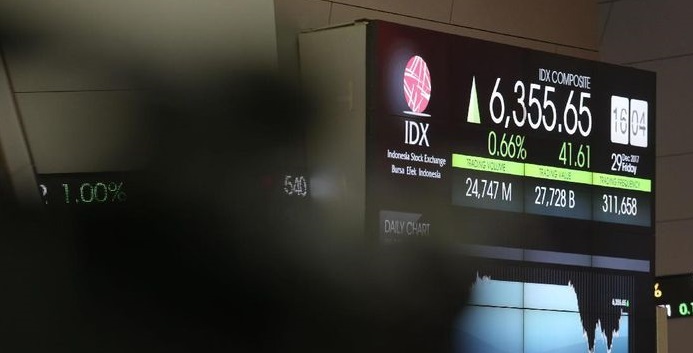 Whereas for the last 12 (twelve) years, Indonesia Composite Index (JKSE) rose from Rp1,805.52 in early 2007 to Rp6,693.47 in 2018. Such JKSE prices were reached in February 2018 at the same time is the highest price ever achieved by all JKSE (all time high). 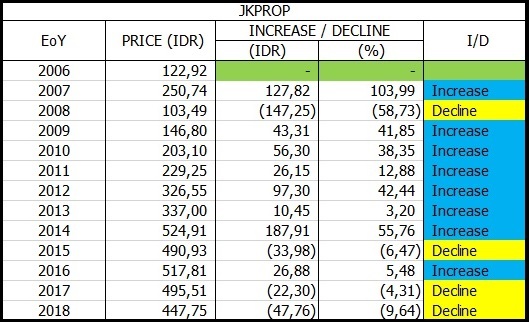 The increase in JKSE price of (Rp.6,693.47 - Rp1,802.52) = Rp.4,887.95 is equivalent to an increase of 270.72% or if averaged at 22.56% per year. Table 1: Data on JKSE growth and the industrial sector on the IDX in 2007 2018. Sequentially the growth of the industrial sector on the IDX was led by the consumption sector (JKCONS) with an average growth of 56.02% per year, followed by the financial sector (JKFINA) of 41.03% per year, basic industry and chemical sectors (JKBIND) 40.41% per year, miscellaneous industry sector (JKMISC) 37.59% per year, property and construction sector (JKPROP) 32.27% per year, mining sector (JKMING) 24.32% per year, trade sector (JKTRADE ) 22.16% per year, the agricultural sector (JKAGRI) is 16.49% per year and the last is the infrastructure sector (JKINFA) of 5.22% per year. Table 2. 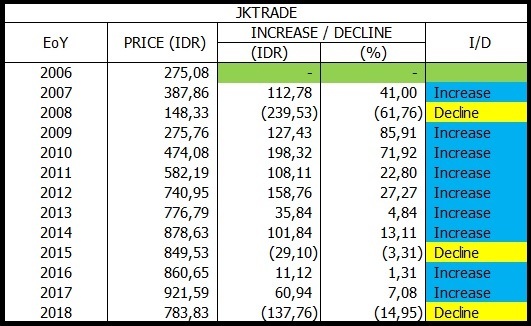 JKSE price data and industrial sector prices on the IDX at the close of the last trading day at the end of 2018. 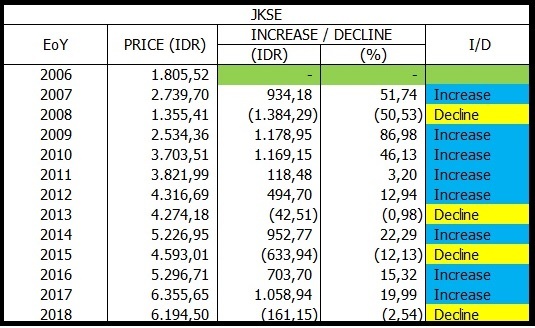 Based on the data in Table 2 above, the growth of JKSE for the last 12 (twelve) years, namely the initial period of 2007 until the end of 2018 increased by Rp.4,388.98 from the original Rp1,805.52 to Rp6,194.50. The increase is equivalent to 243.09% or if averaged at 20.26% per year. While the order of growth in the industrial sector is still led by the consumption sector (JKCONS) with an average growth of 46.22% per year, followed by the basic and chemical industry sector (JKBIND) by 40.09% per year shifting the financial sector position (JKFINA ) from second place to third position which grew only 39.09% per year. The next sequence is the miscellaneous industry sector (JKMISC) with growth of 32.57% per year, property and construction sector (JKPROP) 22.02% per year, trade sector (JKTRADE) 15.41% per year, mining sector (JKMING) 7 , 53% per year, infrastructure sector (JKINFA) 3.16% per year and finally the agricultural sector (JKAGRI) 2.37% per year. According to the data above, the average growth of JKCONS, JKBIND, JKFINA, JKMISC, JKPROP is higher than JKSE growth. While the average growth of JKAGRI, JKMING, INFA, JKTRADE, is lower than the JKSE growth rate. Especially for JKAGRI and JKINFA, the growth rate is even lower than the annual inflation rate in Indonesia. Table 3. Data on JKSE price movements for the period 2007 to 2018. The data in Table 3 above shows that JKSE experienced pressure in 2008 as a result of the global economic crisis that began with the economic crisis in the United States and its effects spread to other countries in America, Europe and Asia. As a result of the crisis, JKSE prices fell (- 50.53%) from the previous year (in 2007). But after the crisis, JKSE could rise for 4 (four) years in a row from 2009 to 2012 with the highest increase occurring in 2009 at 86.98%. In the last 5 years (2013 - 2018), JKSE rose and fell with increases in 2014, 2016 and 2018 and decreases in 2013, 2015 and 2018. Table 4. JKAGRI price movement data for the period of 2007 to 2018. 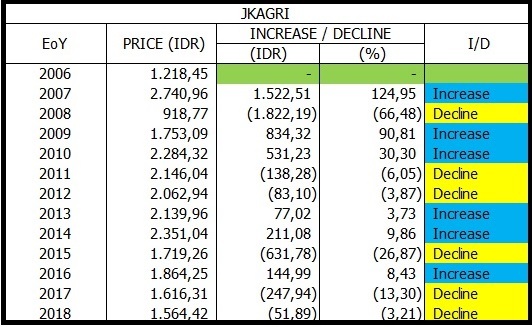 In Table 4 above, it appears that the increase in the average price of shares in the agricultural sector (JKAGRI) occurred in 2007 reaching 124.95%, but then fell sharply in 2008 by (- 66.48%) which was the lowest decline to date this (in 2018). Although later it has increased again, but the increase until the end of 2018 has not been able to exceed the increase in 2007. Table 5. 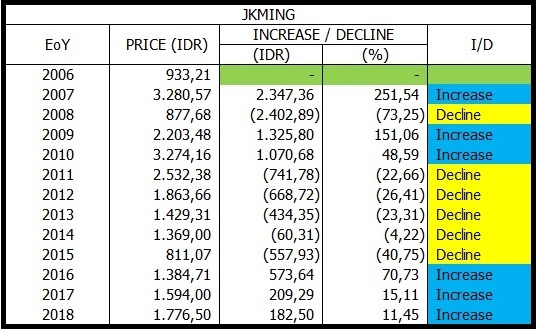 Data on JKMING price movements for the period 2007 to 2018. The data in Table 5 above shows that the mining sector (JKMING) experienced a significant increase in 2007 reaching 251.54%, in 2009 amounting to 151.06% and in 2016 amounting to 70.73%. However, the sharp decline with accumulated declines of more than 100% occurred for 4 (four) consecutive years from 2011 to 2015. Table 6. Data on JKBIND price movements for the period 2007 to 2018. Data in Table 6, basic and chemical industry sectors (JKBIND) decreased only in 2008, 2013 and 2015 with the deepest decline in 2008 amounting to (- 42.60%). But in addition to these years, JKBIND always experienced an increase with the highest increase achieved in 2009 reaching 102.93%. Table 7. Data on JKMISC price movements for the period 2007 to 2018. Data in Table 7, the miscellaneous industry sector (JKMISC) experienced the deepest decline in 2008 amounting to (- 54.18%), but the highest increase occurred 1 (one) year after that in 2009 reached 179.83%. In the last 12 (twelve) years, JKBIND only dropped in 2008, 2013 and 2015, while in other years JKBIND continued to increase. Table 8. Data on JKCONS price movements for the period 2007 to 2018. During the economic crisis in 2008, all industrial sectors were affected, including the consumption sector (JKCONS). But in the midst of the severe decline that occurred in other sectors, the decline in JKCONS prices as the data in Table 8 above only amounted to (- 24.96%), far less than the decline in other sectors. Even the decline is still below the decline in JKSE which reached (- 50.53%). A year after the crisis, precisely in 2009, JKCONS grew significantly by 105.39%, and the following years JKCONS growth continued to increase. It is true that there was a decline back in 2015 and 2018, but the decline was not significant when compared to the gains achieved in previous years. That JKCONS is relatively more resilient than other sectors, and JKCONS's growth is relatively stable with a tendency to increase. Therefore JKCONS can be considered as one of the means for long-term investment. Table 9. JKPROP price movement data for the period 2007 to 2018. The property and construction sector (JKPROP) according to the data in Table 9 above experienced the deepest decline in 2008 as big as (-58.73%), however in the following years JKPROP could rise again, and the highest increase occurred during the presidential election campaign 2014 reached 55.76%. During the presidential election campaign, construction shares were indeed the prima donna along with the campaign for the construction of road infrastructure, dams, airports, etc. which are jobs in the business fields of construction companies. Table 10. 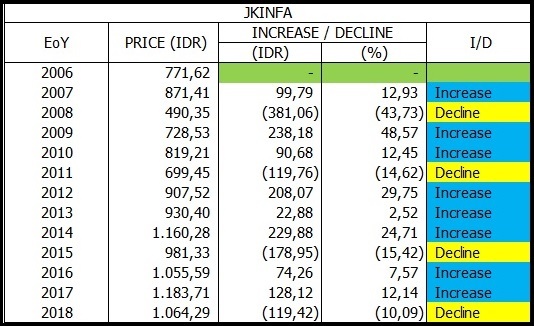 Data on JKINFA price movements for the period 2007 to 2018. Unlike construction stock issuers, although the infrastructure development campaign during the 2014 presidential election was one of the trending topics, the price movements of shares in the infrastructure sector (JKINFA) as well as the data in Table 10 above were not very significant. The increase was only 24.71%, still inferior to the increase in 2009 of 48.57%. PGAS, TLKM, JSMR, TBIG, GIAA, ISAT, EXCL shares are in the JKINFA sector. Table 11. 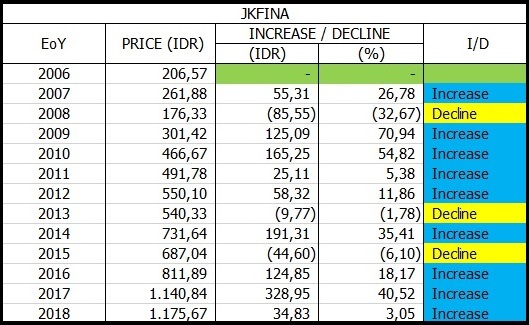 Data on JKFINA price movements for the period 2007 to 2018. Based on the data in Table 11 above, that even though 2008 was a crisis due to the collapse of financial institutions in the United States and Europe, the effect was not too significant for financial institutions (banking) in Indonesia. Data shows that the decline in the prices of shares at JKFINA was only (-32.67%), and even a year later (in 2009) it rebounded with an increase of 70.94%. JKINFA is occupied by large banks in Indonesia including BBRI, BMRI, BBNI, BBCA. Table 12. JKTRADE price movement data for the period 2007 to 2018. Like other industrial sectors, the trade sector (JKTRAD) as the data in Table 12 above dropped sharply in 2008 to reach (- 61.78%), but two years later namely in 2009 and 2010 JKTRADE rose significantly by 85, respectively. 91% and 71.92%. AKRA, ACES, ERAA, HERO shares are part of JKTRADE residents. Based on the above, the movement (volatility) of the share price of the issuers of each industrial sector for the last 12 (twelve) years (2007 - 2018) is very diverse. Therefore, in investing, besides taking a long time, you must recalculate stock valuations periodically (for example every semester), especially when stock prices have risen significantly. In the context of the price volatility referred to above, even though our investment has only been running for 1-2 years in a stock, if the market price of the stock has risen far higher than its real value (book value) or has far exceeded overvalued, at that time consider selling it immediately. Table 13. Correlation of price movements of the industrial sector with JKSE for the period 2007 to 2018.
a. In 2011 JKSE went up but JKAGRI, JKMING and JKFINA actually declined (negative anomalies). b. In 2012 JKSE experienced an increase but JKAGRI and JKMING declined (negative anomalies). c. In 2013 JKSE dropped but JKAGRI, JKCONS, JKPROP, JKINFA and JKTRAD went up (positive anomalies). d. In 2014 JKSE experienced an increase but JKMING actually experienced a decline (negative anomaly). e. In 2017 JKSE experienced an increase but JKAGRI and JKPROP actually dropped (negative anomalies). f. In 2018 JKSE dropped but JKMING, JKBIND, JKMISC and JKFINA actually rose (positive anomalies). 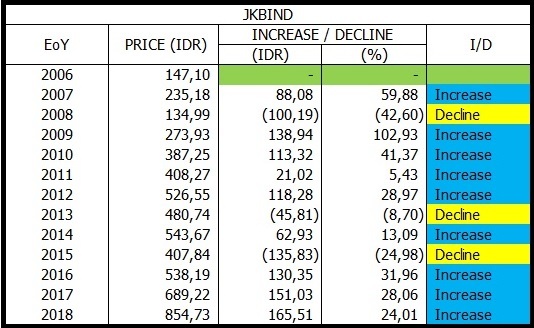 Industrial sectors that have inline price movements and always have positive anomalies with JKSE are JKBIND, JKMISC, JKCONS, JKINFA and JKTRAD. This means that when JKSE experienced an increase or decrease, the five industrial sectors experienced an increase or decrease as well, but also occurred when JKSE declined, the five industrial sectors continued to rise. The industrial sector with inline price movements and sometimes positive or negative anomalies with JKSE is JKAGRI, JKMING, JKPROP and JKFINA. This means that when JKSE experienced an increase or decrease, the four industrial sectors experienced an increase or decrease as well, but also occurred when JKSE rose, the four industrial sectors even declined, or vice versa when JKSE dropped, the four industrial sectors actually rose. Based on the description above, hopefully the industry sector can be selected which you think is prospective and appropriate to be used as a means of investment, and then if you are sure of the industry sector of your choice, then look for issuers who become leaders in the industry sector of your choice.